Make your dog or cat the envy of the neighborhood by visiting Paws Pet Resort & Spa. Our Grooming Salon & Spa offers all the luxuries you expect from a human spa. Whether your pet needs a clean up after a day of fun at our stimulating daycare, or maybe just some pampering, your pet is guaranteed to look amazing after a luxurious day at our spa. We’ll make your pet look fabulous! Includes a superior bathing experience with our Hydrosurge Bathing System and our Hypo-Allergenic shampoo & DermaSilk conditioner or any of our other specialty shampoo and conditioning products. This system helps penetrate coats to rid of dirt, dander, and loose hair while relaxing and massaging your pet. The spa treatment also includes a full brush out to further remove dead hair from the coat, plucking and cleaning of ears, trimming nails and neatening of feet. 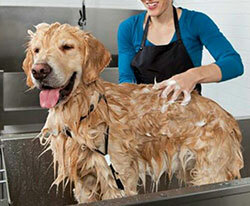 Grooming is by appointment and pricing is dependent on breed, style or trim and coat condition. Please call us for more information or to schedule an appointment. Just a short note to thank you for taking such good care of Eve when she has stayed with you and come in for grooming. I was very impressed that Eve’s rugs and blankets were all washed when I came to pick her up. I know you all take great care of her, because she jumps out of the car and runs up to the doors as soon as I pull up.